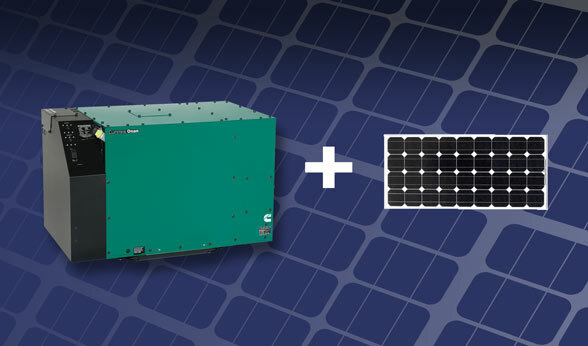 ...Onan & Agriculture Solar-Diesel Hybrid Generators Increases Efficiency, Lowers Cost of Gas and Maintenance. Agriculture Solar considers the challenges you face right now and makes equipment to overcome them. At the same time, we keep in mind the realities of the future, including ever-evolving environmental regulations. We're ahead of the curve on environmentally conscious systems. So when we engineer EPA-compliant hybrid generator power systems, you can be sure they meet all federal requirements without the need for expensive upgrades. Onan and Agriculture Solar stays with you all the way. The Onan Diesel Series and Agriculture Solar models are the heavy-duty choice when low noise and low vibration are required. The revolutionary design makes these generator sets quieter than other diesel-powered generators, and quieter than most gasoline sets. The unit is totally enclosed, including cooling, muffler and intake systems. At Agriculture Solar, Onan Hybrid Generators and Agriculture Energies can be your simple solution. Onan generators have been powering the world’s machines and engines since 1920. Agriculture Energies systems have been successfully active in the top irrigation fields for over 10 years and continues to bring the tried and true principles and advantages of solar hybrid power. Think about it, and then make your move. Let Kohler and Agriculture Solar power management provide you with decades of reliability and lasting value.